The rumors about the release of Apple’s long awaited Tablet has been on fire for the last few days and so are the speculations about its name. A day earlier, we informed you that Apple had secretly purchased the domain "iSlate.com" back in 2007. Domain was registered through some intermediary by the name ‘Markmonitor.com’ to disguise the real owner. You can check out the screenshot of that registration form which we have posted here. Today, Macrumors quoting fscklog has posted that ‘Slate computing’ company that registered ‘iSlate’ in 2007 has also registered ‘Magic Slate’ as its trademark. Whether Apple is going to choose ‘iSlate’ or ‘Magic Slate’ as name for the forthcoming tablet is not yet clear. Even NYT editor during in an internal event very cautiously referred to it as "Apple’s upcoming slate". Confusion persists and discussions continues. The discovery of the name ‘Magic Slate’ has added fuel to the fire. For the last two years, Apple registered these names under cover of ‘Slate Computing’ company. An announcement about it is highly expected to me made on January 26, 2010, at a mega event to be held at Yerba Buena Center for the Arts in San Francisco. Among all the rumors about Apple and its almost realized Tablet, its name still remains a big question mark and a mystery which is yet ot be resolved completely. ‘iSlate’ or ‘Magic Slate’, both the names neither appeal to my mind nor match the trendsetting next-gen names like iMac, iPod or iPhone. Something on the lines of iTablet, Macbook Touch, or iTouch may have been more appropriate and Apple like, in my honest opinion anyway. what do you think? 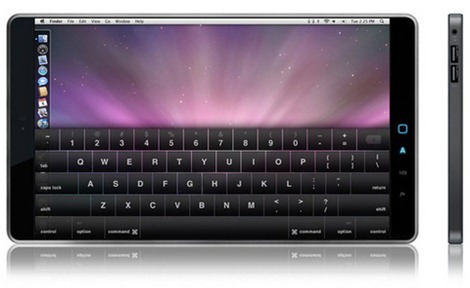 Apple MacBook Touch: Is it coming?